The Giza Plateau near Cairo, Egypt (photo taken from my seat in our airplane on final approach as we flew to Cairo airport -- pure luck!). 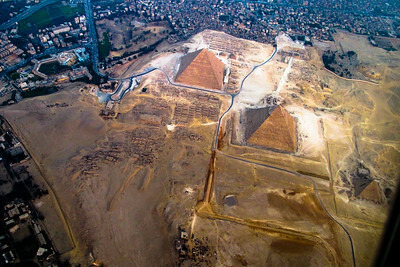 The three principal pyramids (Khufu, Khafre and Menkaure from upper left (north) to lower right (south) and many tombs are visible. In the upper left corner (north) is the Mena House Hotel where we stayed (the buildings that look like a truncated tuning fork are the rooms in the new wings; the older main building is to the right end of the hotel complex. 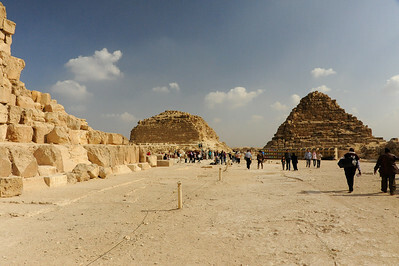 As one enters the plateau by the roadway (upper left in this photo), passing parking spaces on the right, the Great Pyramid is immediately in front. Busses park off the road (to the left of the Great Pyramid in this photo along its northern side). 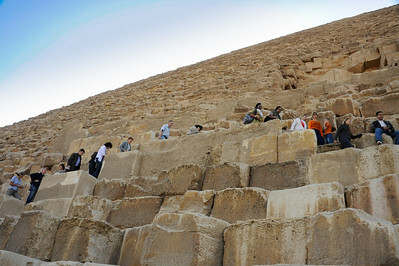 Visitors can walk a short way up the north face of the Great Pyramid. 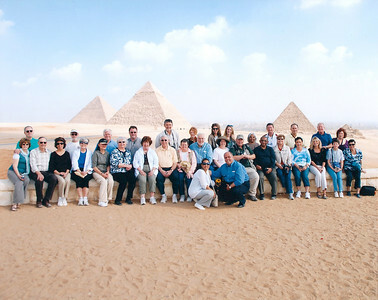 Somewhat visible in this photo is the concavity of each face of the Great Pyramid. The faces are not flat, but slightly indented or concave. 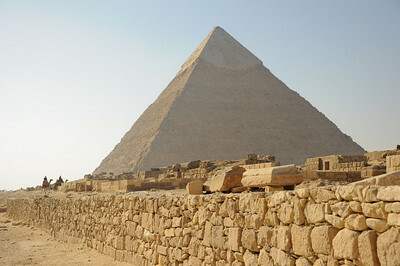 One theory is that the pyramid is a scale model of the northern hemisphere and the distances around the pyramid at various elevations measure the circumference of the earth at various latitudes, and that the concavity is necessary to account for the earth's non-spherical oblate shape. Okay. 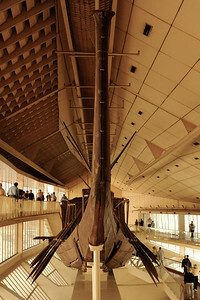 On the southern side of the Great Pyramid is the boat house. 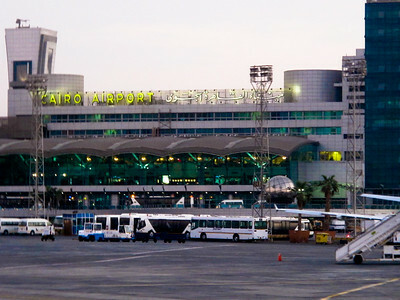 Cairo Airport upon our arrival at dusk. 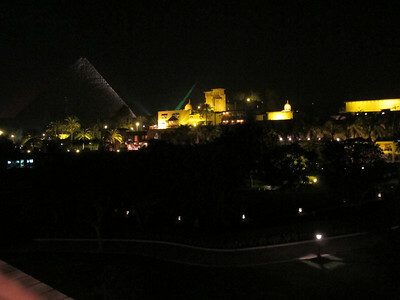 Great Pyramid of Khufu (left) at night from Mena Hotel at the foot of the Giza Plateau. Pyramid of Khafre (son of Khufu) to the right. Mena Hotel main building in front of pyramids. 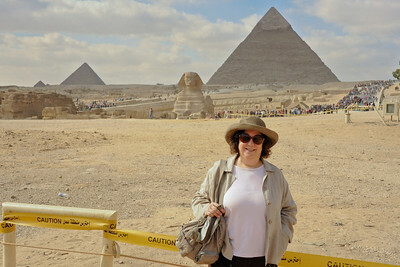 Pyramid of Khafre (son of Khufu) in background. 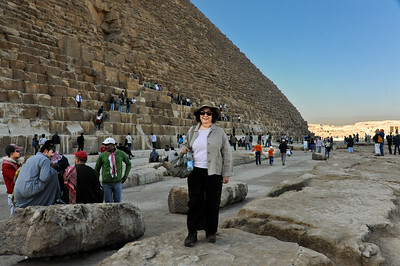 Great Pyramid of Khufu in foreground. 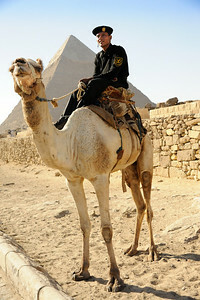 Egyptian Tourist Policeman at the Giza Plateau. 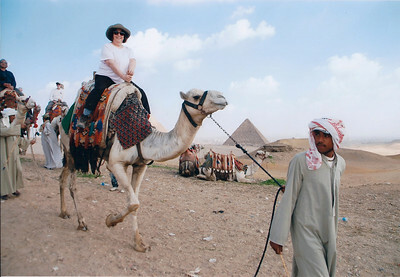 The Pyramid of Khafre is in the background. 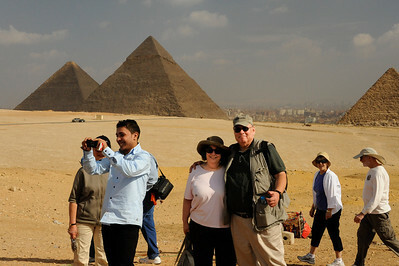 Pyramid of Khafre (son of Khufu) in background. Tombs of lesser royalty (foreground). 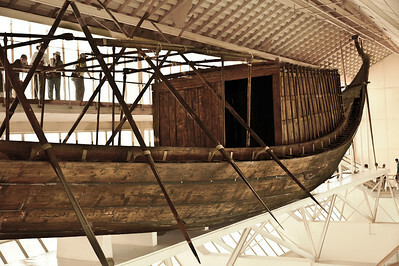 Khufu's "Solar Boat" or "Solar Barge" believed to be a ritual vessel to carry the resurrected king with the sun god Ra across the heavens. 143 feet long and 19.5 feet wide. 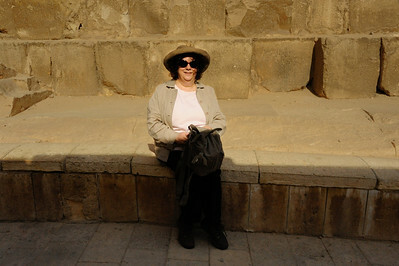 Renee Mirsky outside the Solar Boat Museum on the Giza Plateau. 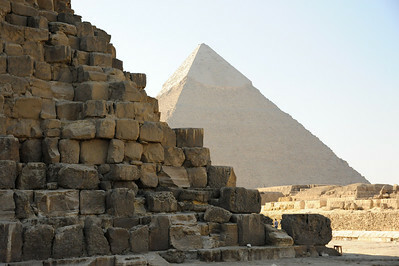 Two of three Queens' pyramids on the Giza Plateau, alongside the Great Pyramid of Khufu. 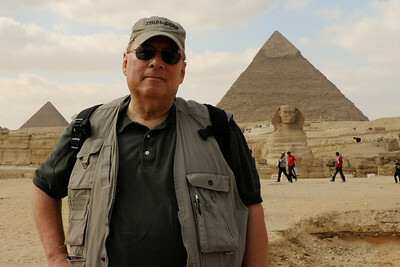 Ellis Mirsky on the Giza Plateau. 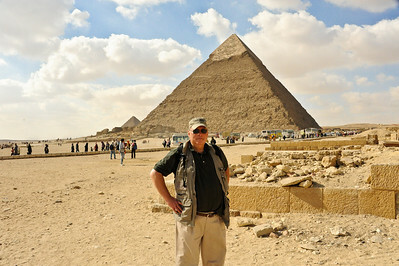 The Pyramid of Khafre (son of Khufu) looms in the background. The Pyramid of Menkaure (aka Mycerinus; son of Khafre; southernmost) is the left. 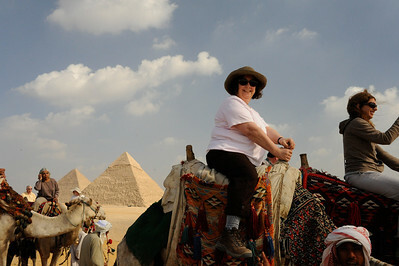 The Giza Plateau. 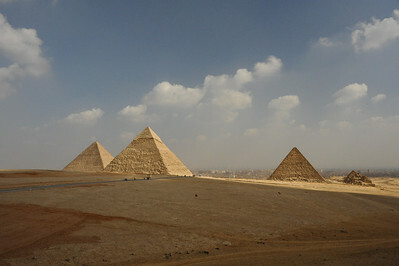 The Great Pyramid of Khufu is to the far left. 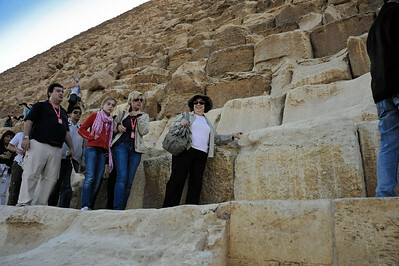 The middle pyramid is the Pyramid of Khafre (son of Khufu). The Pyramid of Menkaure (aka Mycerinus; son of Khafre; southernmost) is to the right. 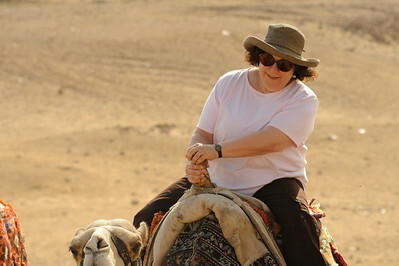 Renee Mirsky on a camel at the Giza Plateau. 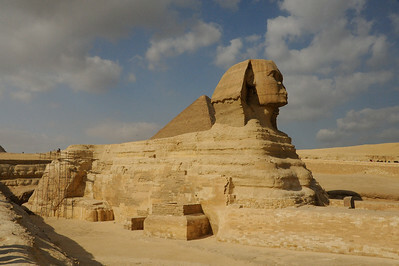 The Great Sphinx and the Pyramid of Khafre. 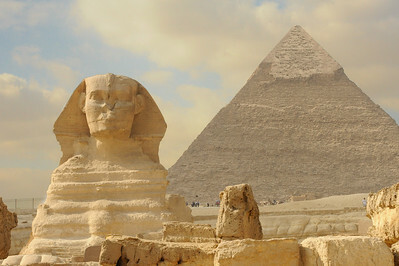 The Great Sphinx (the Great Pyramid of Khufu in the background). 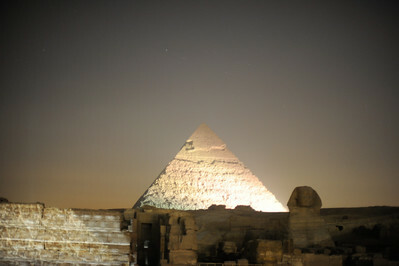 The Pyramid of Khafre illuminated during the Sound and Light Show. 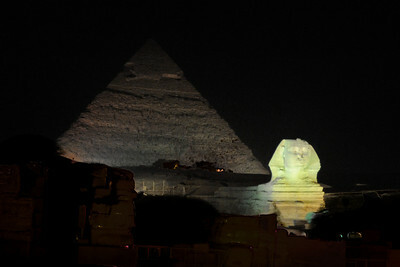 The Great Sphinx and the Pyramid of Khafre illuminated during the Sound and Light Show.